I downloaded the wallpaper of the metal background a long time ago, and can not find the source. If you recognize it let me know, and I will add appropriate credits and links. Cheese is a marvelous thing. I do like a great Gouda with grapes, or a beautiful Basque with black olives (green olives are actually better, but doesn’t sound as poetic). Many of our friends roll their eyes when I tell them they can’t start eating yet because the cheese has to “breathe” first (Thank you Jason for teaching me that trick!!! Amy, thank you for encouraging my “habit”!). I have been accused of being a cheese snob more than once, but I prefer the work “enthusiast”. 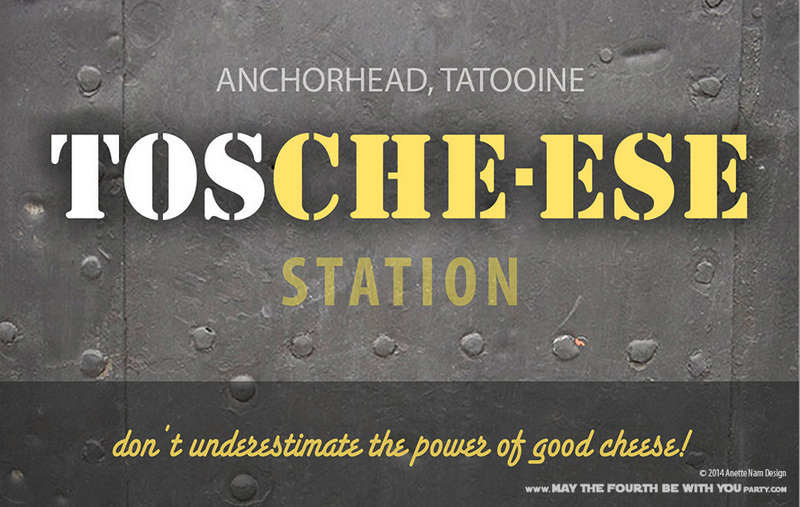 So when we came up with the idea of a Tosche-ese Station last year, I was almost overwhelmed by the possibilities. After several trips to the cheese counter at Whole Foods, Trader Joe’s and Meijer, and confusing the heck out of the friendly staff with questions such as “which cheese will separate less when molding”, we finally settled on this spread. Note: As always, you may download the picture above for your personal use, but you may not use to sell or use for any professional party services. We would love for you to link to our downloads, but you may not download and then upload and offer as downloads on your own site. Also, please include “© Anette Nam Design” and maythefourthbewithyouparty.com if you share, post or publish your photos of our designs anywhere… and please let us know when you do, ‘cuz we love to see how our work is being used! THANKS! It was a big hit, I think it might have been the best received food since we started the M4Ps. I will have the instructions to the specific cheeses in subsequent posts. So check back! The centerpiece was a last minute idea. And as much as I would love to say it was a cake, it is a just storm trooper helmet. 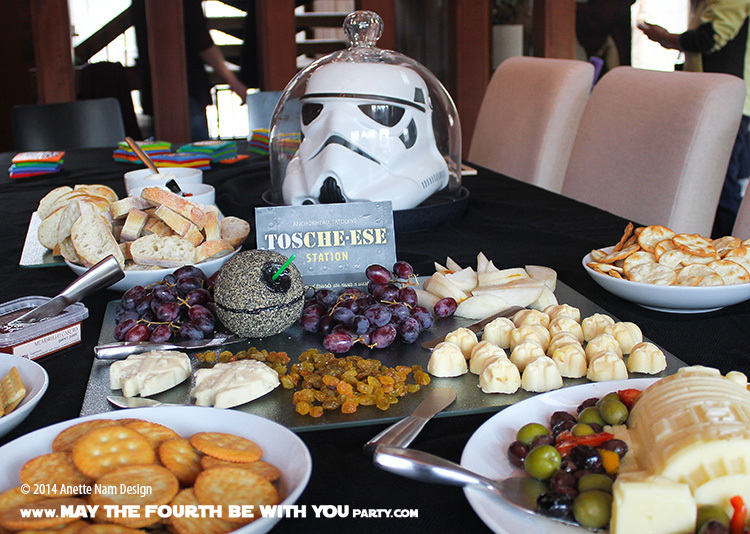 Lastly, there seems to be some confusion on the actual spelling of Tosche (Toshi). So I settled on Tosche for obvious reasons.